Not sure we needed a post on this, but he insisted!…. 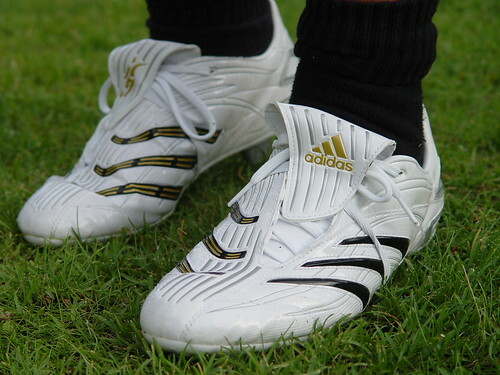 So, his new boots. David Beckham ones he says. It’s got DB on the side of ’em, so I guess he’s right. He had the first training session last night, more tonight and tomorrow. The team seems OK, not too bad, some good passing, tackling and defending as well as Sam and some other kid teaming up well in midfield and upfront. The coach is quite good, she got them doing some quite useful drills and was doing plenty of shouting at them, which I like. Make the little buggers work! 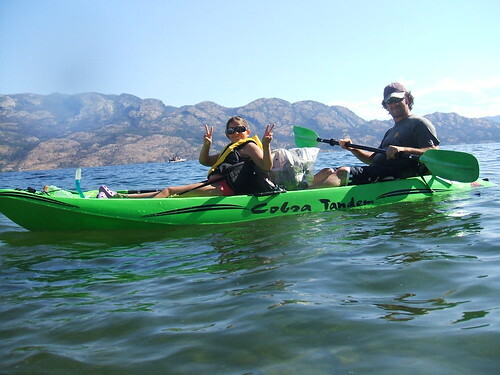 So we’ll see how the Kelowna U12’s do, when they meet Vernon, Penticton and Kamloops on Saturday…. Saturday afternoon, 30 degree heat, so we decided on a little lake exploration…. We set off for Pebble Beach, the last beach you can get to in Westbank, before you have to head over the mountain down to Peachland, and parked up. So, setting off with the supplies, I kayak’d round the headland, whilst the missus and the kids swam, walked and paddled. As you pass around the headland, just going out of view of the beach, we discovered loads of secluded beaches along with overhanging rocks and caves. Clearly, kids get their boats and come round here for parties, judging from the fires we found in caves and on the beaches. Peace and quiet, the water was warm and crystal clear, a fine afternoon was had. We got back to the beach about 3 hours later, pitched up ate some fruits swam some more and generally had a great time. We plan to come back round here again sometime soon, with a BBQ and a few beers to watch the sun go down over the mountains. Might need a bigger boat though…. 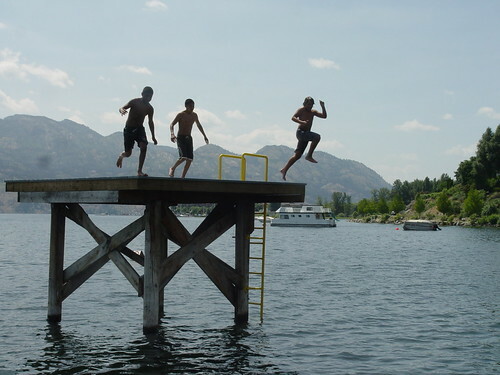 Diving @ the Ferry Docks…. …. 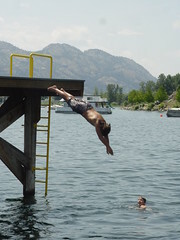 so the kids are pestering me all day to go down to the lake for some diving. Daredevil that he is, his courage has got him diving off the platform this year. I was going to go for it too, can’t have him upstaging his old man, but the "management" have said I’m past it, agewise and may cause myself some kind of injury….. Miss has started diving too. Not bad, her legs getting straighter. Summer holidays are here, the kids are eating us out of house and home…. Mind you, over the last couple of mornings, Sam has been knocking up a fruit salad for him, me and Holly. 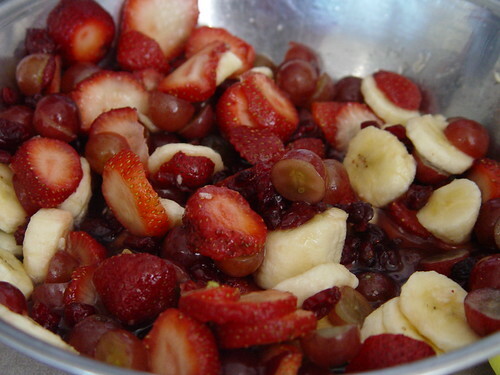 Strawberries, bananas and grapes, all organic. This morning he’s thrown a few cranberries in it. Not bad. He may be a chef in the making.